Mecidiyekoy is located in the intersection point of metro bus and tube, therefore it became one of the most running traffic districts in Istanbul. Raising and declining dynamic structure of Trump Towers comes from this location which is heart of the transport and the junction for Asia and European which receives for 4 million people per day. 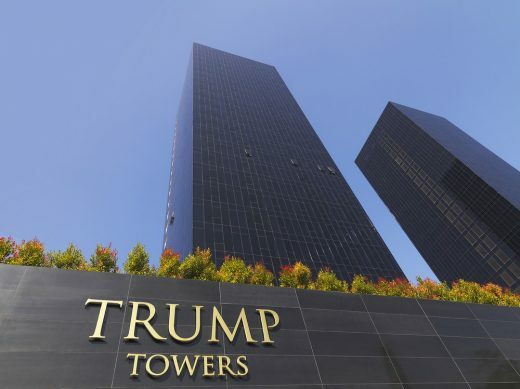 Contrary to the common formed high-rise buildings, Trump Towers has a sculptural and dynamic image because of its prismatic and angular facades. Therefore it has a privileged place within Istanbul’s silhouette. The blocks were designed elaborately as the silhouette effect was considered, and for them to be more slender, the units in both sides of the core were approached as different units around the transparent mass which provides natural light for the core. Paraphet panels in the front side are placed to add rhythm to building’s virtual movements by seeking compact-empty rate. Also dynamic surface expressions were created by using variations. As well, vision perceptions of the units with similar plan scheme are diversified like this. The movements of volumes are expressed with contrast; black and white. By those impacts, one traveling on E5 highway would perceive the tower turning around its own core. Using the space as useful as possible can be considered one of the most important aspects of environmental-responsible idealogy. With proper spacing, all costs from lighting to ventilation decrease instantly. The facade is designed to have the maximum efficiency from sun. Facade ratio of transparent and opaque surfaces are decided so that maximum efficiency can be obtained in terms of both lighting and heating.Rather than having a central system,each unit has its own control, so that people can utilize their own own living temperature. As an advantage, local materials are used and costs of transportation are minimized.